Cute Beeswax Candles found at the Dharma Boutique! Beeswax burns longer and produces a warmer glow than paraffin candles, and also generates healthy negative ions, which eliminate dust, pollen and allergens from the air we breathe. Perfect for the eco-friendly candle lover! Winter season is up and running, the gift period is here, stores start being congested... I will not reveal yet what I am preparing to offer, but I will share insights on gifts that are trendy these days. 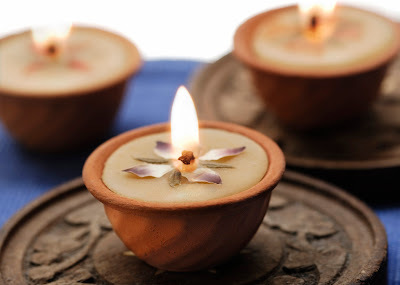 For instance when sustainability and ethnic gifts go hand in hand, one can propose anything from the eco-friendly candles pictured above to Vintage Statues, marble deities statues that originally served in temple! If they happen to be damaged, they are retired from the place, later repaired, placed in purifying sacred water (like Rajasthan's Pushkar Lake or the Ganges River), and offered online... How neat! Creating your own inspirational room or looking for a special gift, you can combine candles with colorful devotional art, reproduction paintings in antique frames or lithographs from India. You can wrap your favorite room with traditional textiles, combining the right texture to the right colors and patterns. 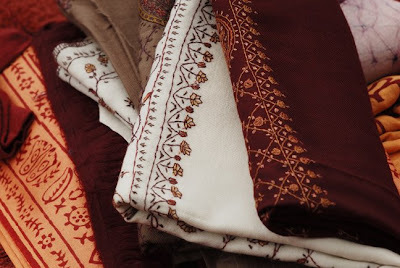 Hand-embroidered tribal fabrics from all over the world are very appealing and fit really well with an eco-friendly interior.